Founded in 2007 by a mother and daughter team, BAGGU set out to offer a stylish and durable alternative to the disposable plastic bag. Since then, their product line has grown to include backpacks, purses and even umbrellas, but their distinctive nylon shopping bag is still the brand's best seller. They're so popular, in fact, that last year BAGGU launched a whole concept store around them. 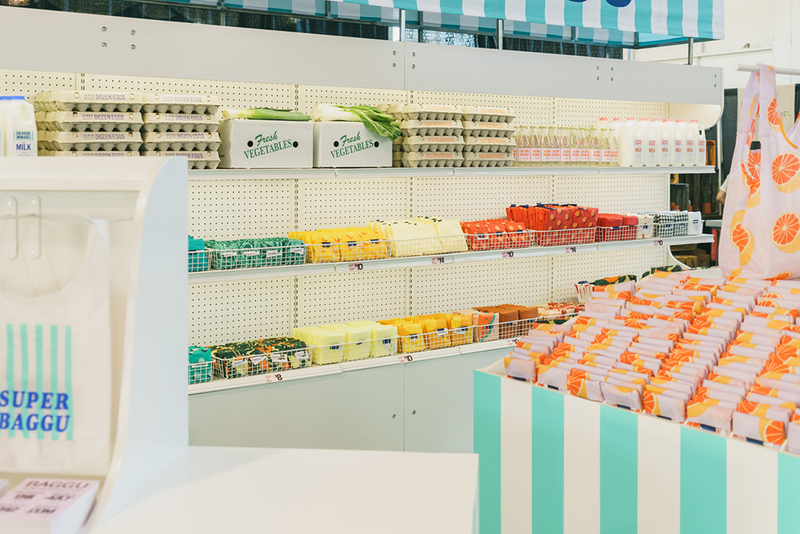 Superbaggu is the brand's pop-up grocery, filled with their newest prints stacked like produce in tidy displays. 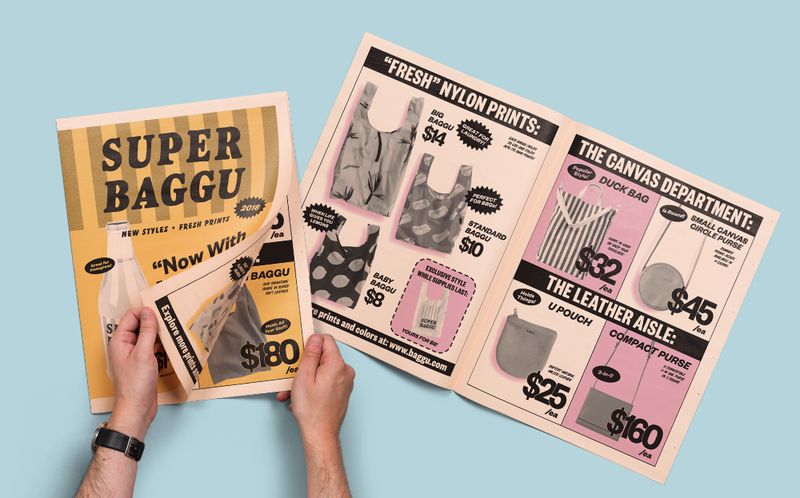 To go along with it, BAGGU produced a catalogue inspired by classic grocery circulars, printed on our tabloid newspapers. Superbaggu pop-up shop at West Coast Craft in San Francisco. Below, we catch up with BAGGU senior store manager Molly Marrone and head of brand Nick Almquist who tell us more about the concept and how a circular from the 90s (that they found in a woodpile!) inspired the retro newspaper design. What was the design process like for Superbaggu? 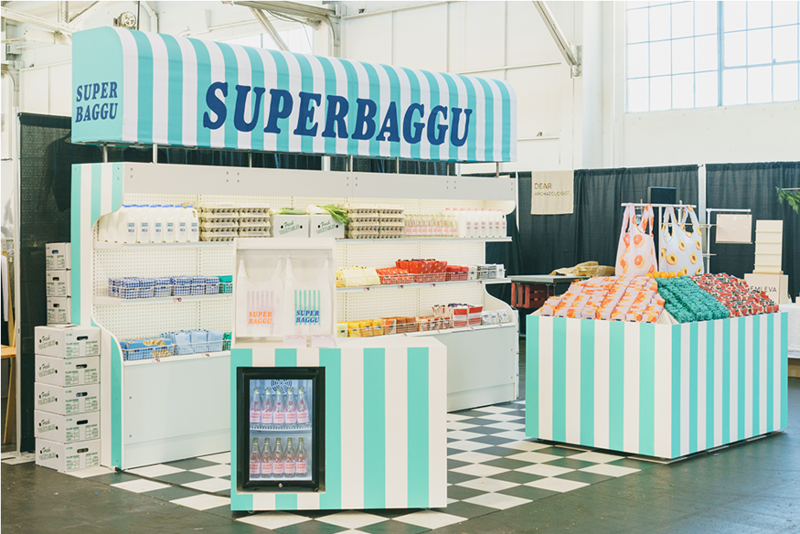 We originally designed Superbaggu for last fall’s West Coast Craft, and it started with just the idea of a grocery store filled with reusable bags. 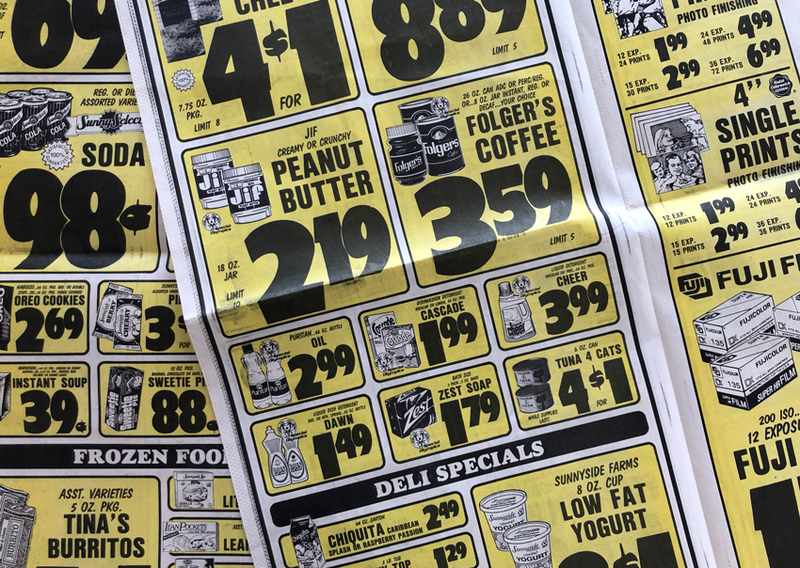 We spent a bunch of time riffing on vintage supermarket aesthetics – first we worked up a logo, some colors, some type treatments, and then we used those to drive the design of the pop-up itself. 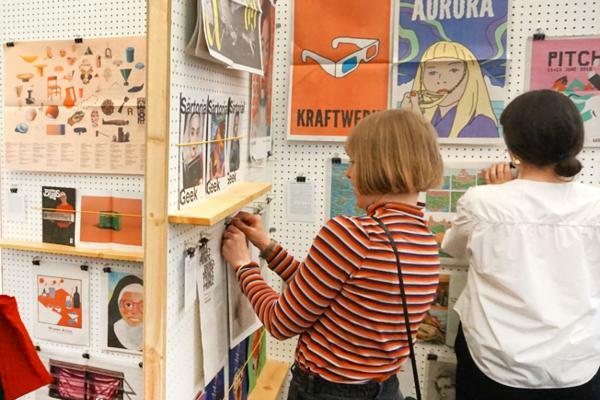 Lots of little branded pieces went into filling out the experience – milk jugs, egg cartons, seltzer bottles, price tags, jackets – and the newsprint circular became one of those elements! 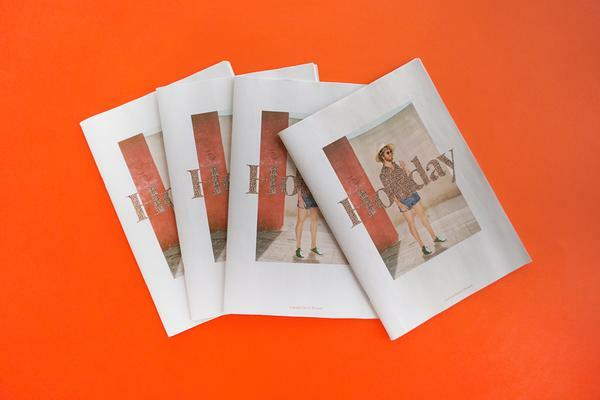 BAGGU catalogue printed as a traditional tabloid. How did you use your newspapers to support the concept? 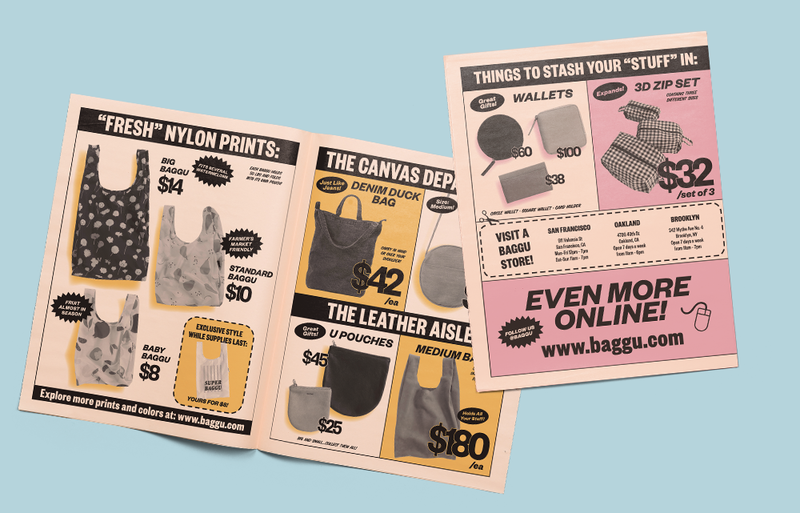 Since Superbaggu displays only a small part of our product line, we wanted to encourage customers to visit our website to view the entire collection. 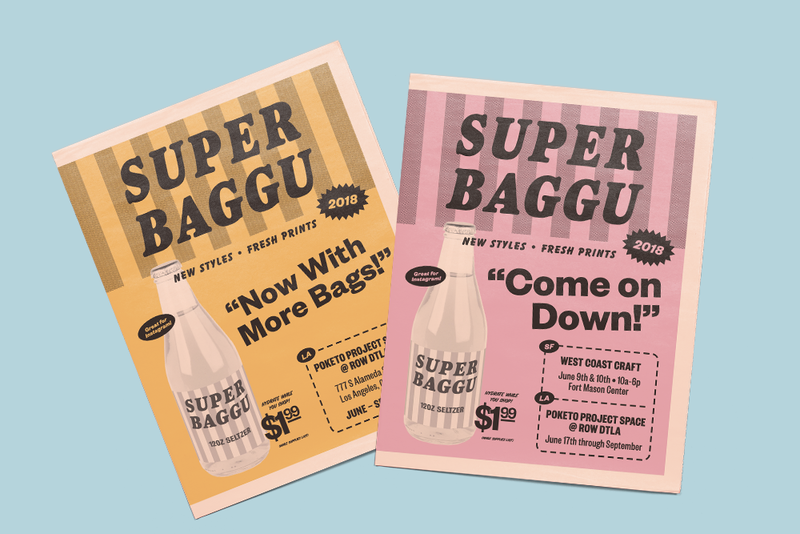 We wanted an element that sparked delight and fit into the concept for Superbaggu - and the newspaper circular idea was born. Did you learn anything new in the process of making your newspaper? We learned that getting newspapers made was much easier and faster than we anticipated! Rescued from a woodpile, this vintage grocery circular inspired the design for BAGGU's newspaper. What was the inspiration behind the retro design? Our biggest inspiration came from a pair of old grocery circulars that our coworker found underneath a woodpile at her parent’s cabin (pictured above). They nearly wound up as kindling, but thankfully she saved them! 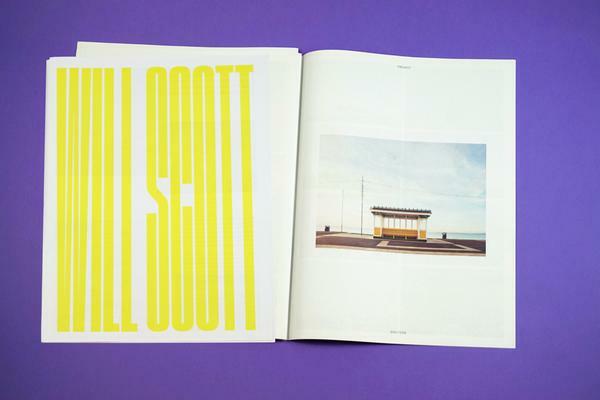 They’re from the early 90s and the design is pretty amazing in this beautiful, vernacular way. When we saw them, we knew we needed to make one of our own. How have folks responded to the newspapers? Our customers have loved it! 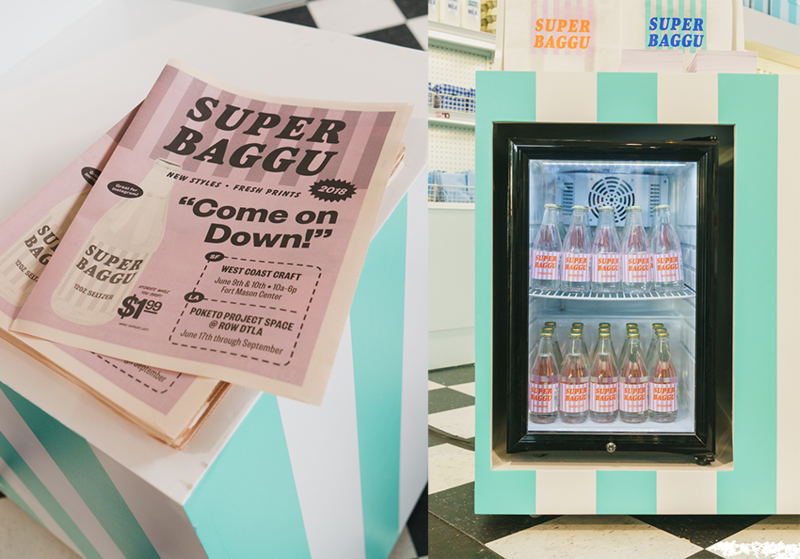 Having a physical takeaway of the Superbaggu branding has been really impactful for people who want to revisit and share the experience on social media and with their friends.